Born in the Uk and transplanted to the U.S. as a boy, Kolosine survived by playing in bands and obsessing over music throughout his youth. Kolosine began his career in the “business” in college radio, where he was Music Director, as well as local music producer and engineer, for WVFS in Tallahassee, FL. He also earned degrees in Political Science and English at Florida State University, and served a stint in Florida state government working as a Press and Communication Officer. Leaving behind Florida, Kolosine took a job in Promotion at New York-based record label Caroline/Astralwerks. 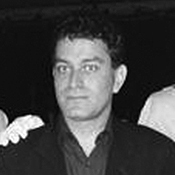 Over the subsequent 14 plus years, Kolosine rose to General Manager in 1999 and oversaw all elements of the label, including promotion, identity and A & R. Kolosine’s Astralwerks’ successes boasts a long list of innovative, top selling, Grammy winning and international artists, including Air, The Beta Band, Beth Orton, The Chemical Brothers, Fatboy Slim, Brian Eno, Kraftwerk, The Basement Jaxx, The Ben Folds Five, Caesars, Royksopp and many others. He has worked closely with some of the most critically acclaimed and popular artists in today’s music scene and worked extensively in the areas of soundtracks, licensing, branding, sponsorships, social and new media initiatives. “Being John Malkovich”, “V For Vendetta”, “Adaptation”, “Flushed Away” and “SSX-3” where among the soundtracks Kolosine oversaw at Astralwerks where he also received an Executive Producer Grammy Nomination for the critically acclaimed soundtrack “Six Feet Under”. Since leaving Astralwerks in 2007, Kolosine has been operating Modern Frequencies, an umbrella for his various work that includes Futurist / Advsior for The Chemical Brothers; managing artists, executive producing and supervising soundtracks (to popular NBC show “Heroes” & as Label Soundtrack Executive on “Rango”); and consulting an array of other artists, soundtracks and labels. Kolosine in 2010 joined the NYU / Clive Davis Institute Of Recorded Music as Assistant Professor and Business Area Head, after a stint as an Adjunct and Visiting Arts Professor. He is currently teaching the Senior Capstone and Music Business Entrepreneurism classes this semester at NYU, while overseeing the new Music Business Lab.